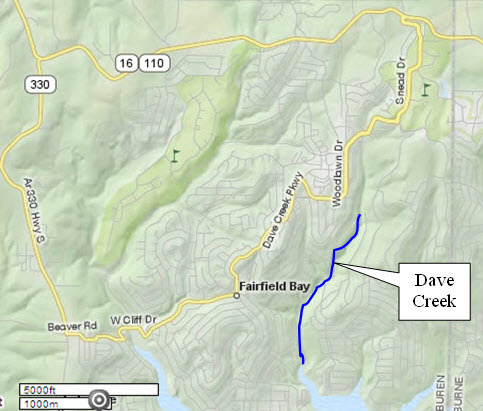 Dave Creek in Fairfield Bay is a Class 2++ run for the very adventurous paddler. I would recommend it for kayaks only; however, I saw a 16′ open boat paddled solo downstream from E. Cliff Drive with only minor mishaps. I like to say this creek is in “downtown Fairfield Bay” though you don’t see any houses while paddling. 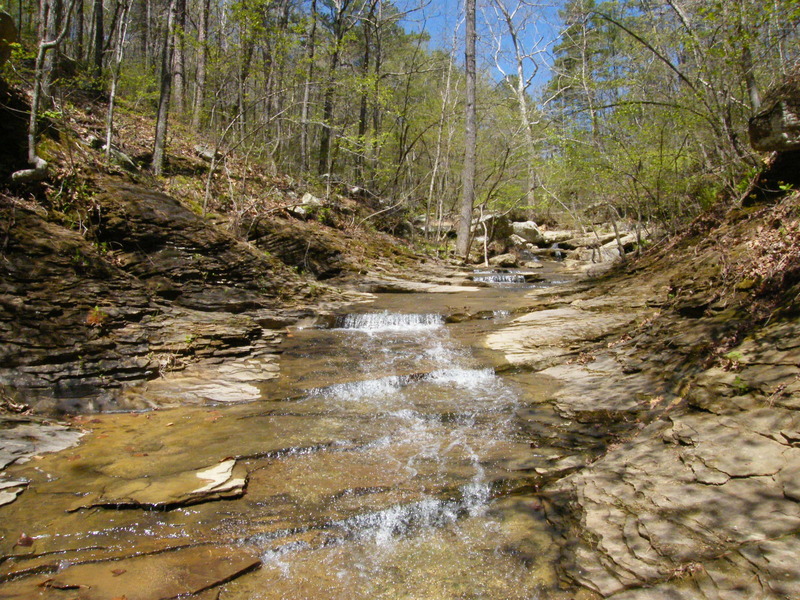 This is a very steep creek, one that wouldn’t get a 2+ rating if it hadn’t been for the rather friendly nature of the creek bed. A lot of it is solid rock that stair steps its way down the narrow valley, mostly just straight paddling. There are some boulder fields, but they are fairly easy to navigate. The most difficult boulder fields are close to the uppermost put-in I have used. 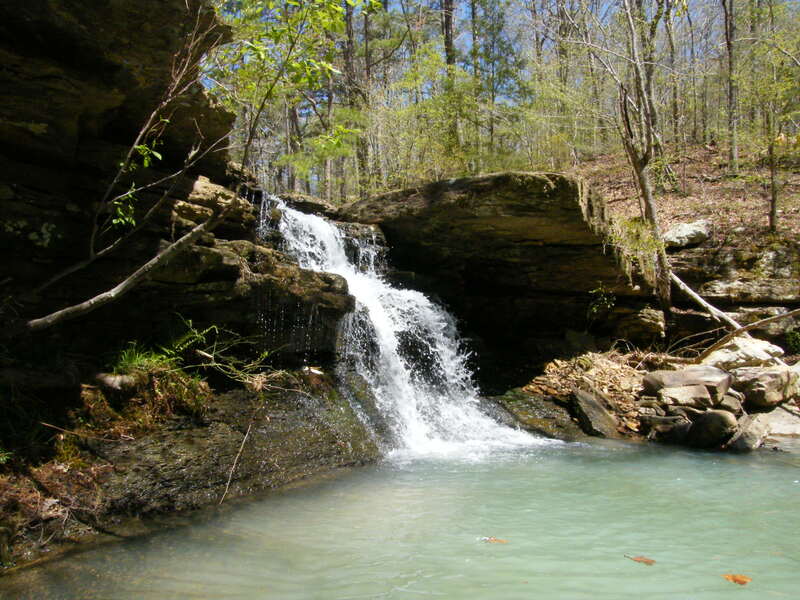 By hiking about a hundred yards upstream of the end of Lafferty Lane, you can put in just below a substantial waterfall. This put-in launches you at the top of a slide where your boat will generate a lot of speed (hazardous) and toss you over a 4 foot step and into a pool. Nothing else on the creek generates that much speed, but this slide and the rough boulder fields below can all be avoided by launching at the point near the end of Lafferty Lane where the road starts up a severely eroded hill. Park short of this low spot that has a pipe culvert under it. You can drag your boat down to the water from the road, on the upstream side of the draw at the foot of the eroded hill. It’s steep; you’ll probably want to put your boat on a leash to ease your way down the hill from tree to tree. 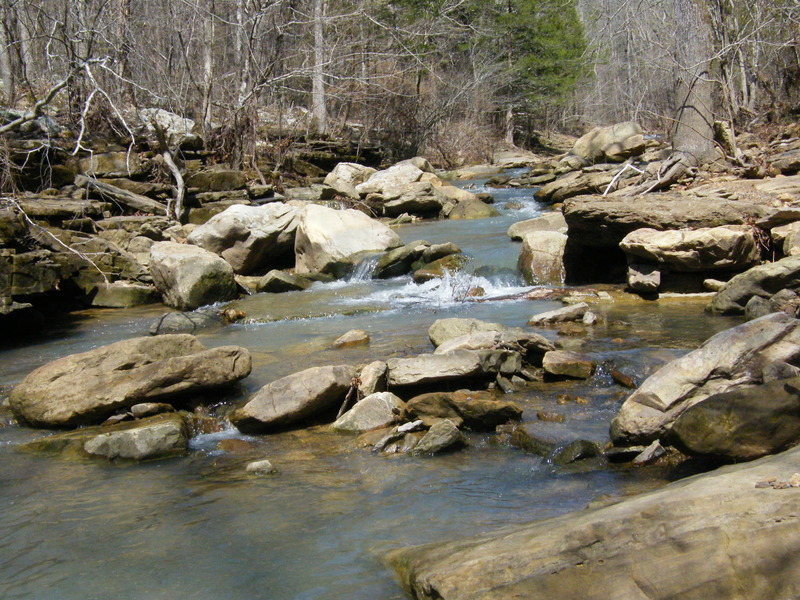 The creek slopes more gently from this point on downstream; however, gently does not mean placidly. There are lots of mini-slides and stairsteps, a few boulder fields (including one that that will require tilting your boat on edge to fit through a V shaped slot). A culvert is finally encountered on a service road to a wastewater treatment plant; the portage is easy. 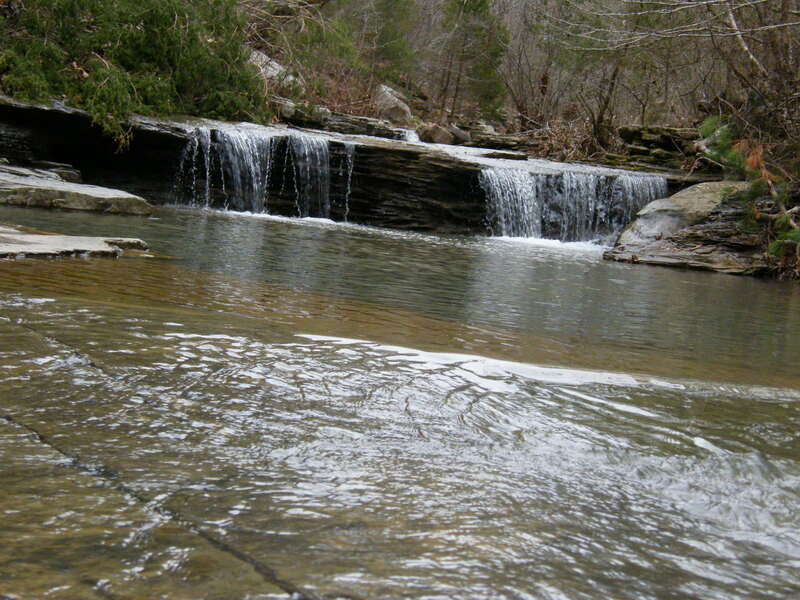 On the far side of the road you will launch on a solid slab of rock that forms a slide down to a small fall. It looks intimidating, but is pretty much a straight shot with a nice pool at the bottom. 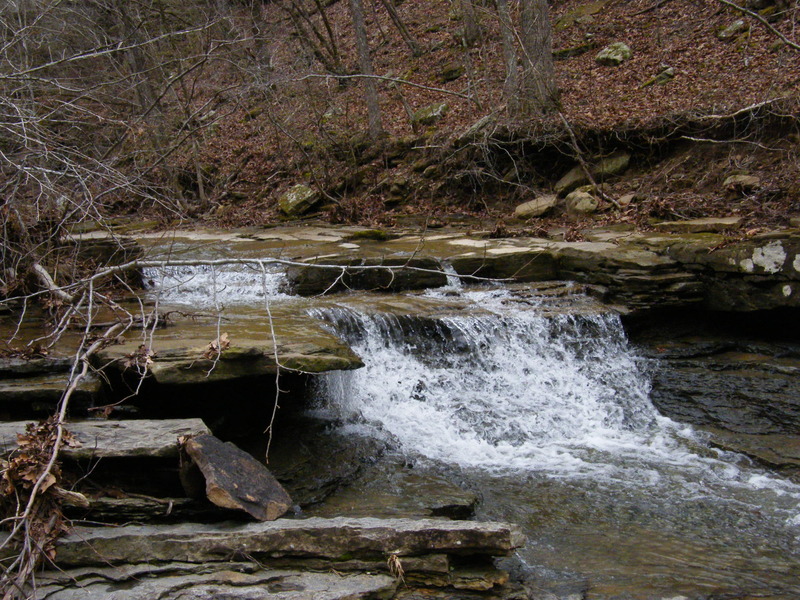 Beware of a cross current near the beginning of this slide; you may want to put in just below the spot where the flow kicks back from right to left as it moves past an outcrop. 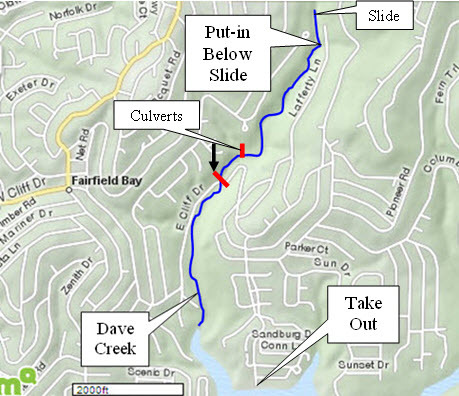 Beyond the pool, the creek moves around a bend, under a few overhanging slabs and approaches the culvert for E. Cliff Drive. 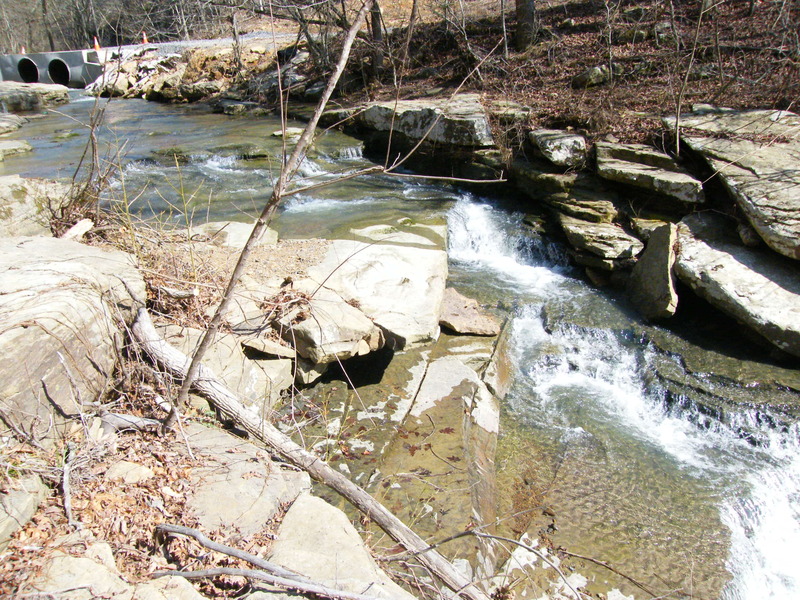 Portage left and launch below the culvert for the remaining mile of the run. 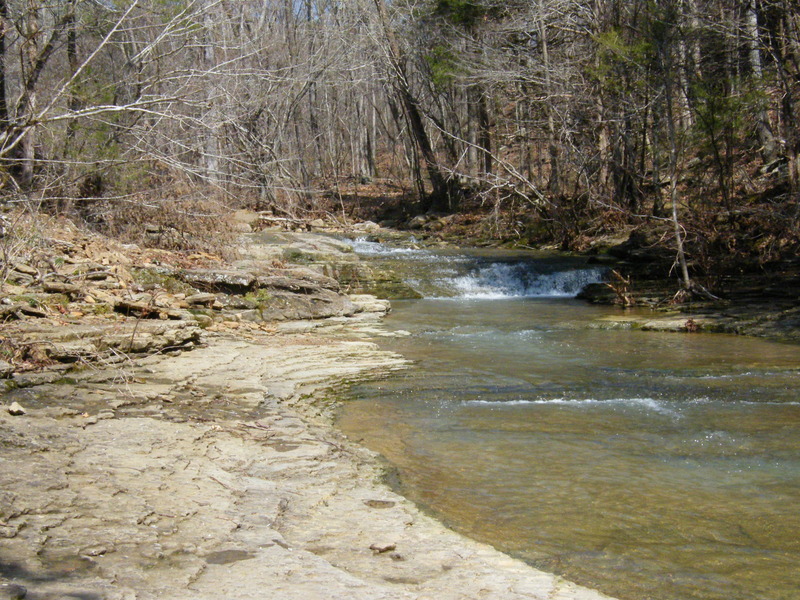 The last mile offers plenty of excitement even though the slope of the stream is becoming more gentle. 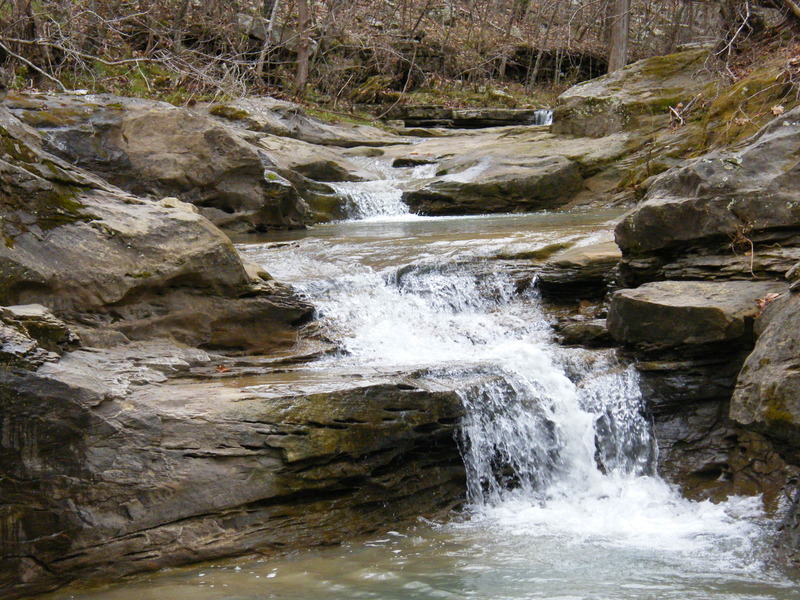 There are a couple of stairsteps and a few boulders, all much easier to navigate than the upper mile of the creek. 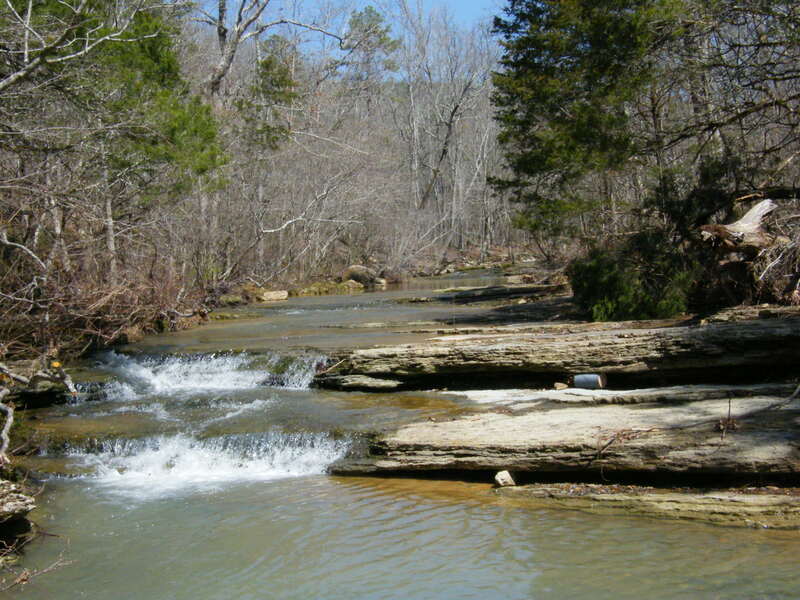 The current is steady until you get to Greers Ferry Lake. A short paddle takes you around a point to the east where Indian Hills Drive runs into the lake and you have left your vehicle. 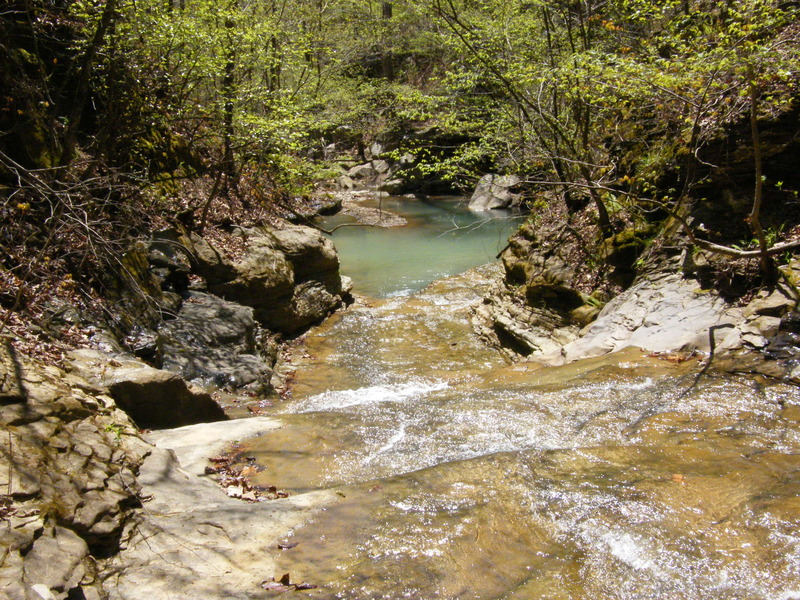 The drainage basin for this creek is very, very small, meaning it rarely has enough water in it to paddle. 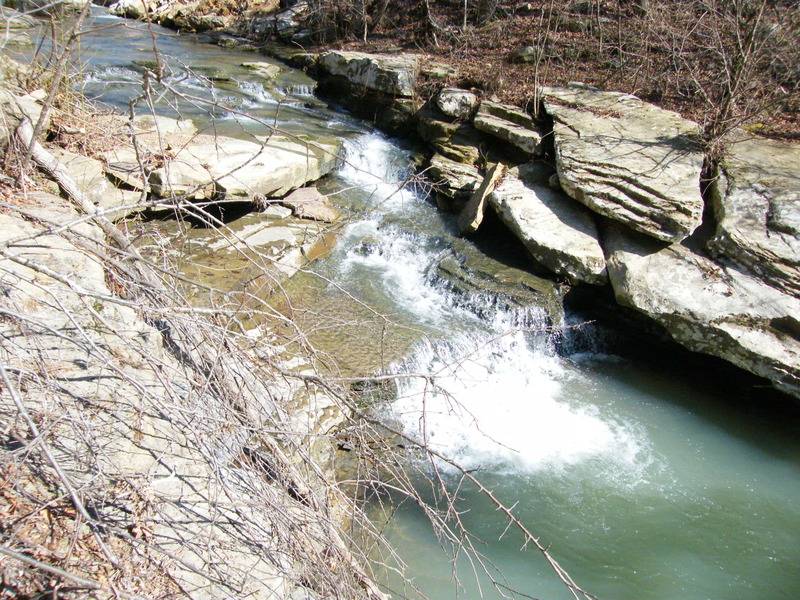 If it appears to have enough water for you to navigate when viewed while standing above the culverts on E. Cliff Drive, then you might give it a whirl. A six inch rain fell about 12 hours before one run. 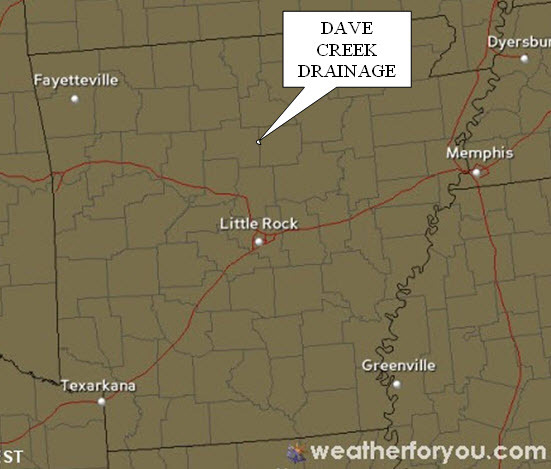 Look for rain falling on the drainage area shown below. A video that shows more of the action from Dave Creek (though not in the order it is encountered while paddling) can be found at the site below.